With results in a way not entirely unlike the Hilliard Ensemble and saxophonist Jan Garbarek, the versatile Trio Mediaeval and trumpet player Arve Henriksen spent time getting to know each other musically in Dalsfjorden on the Norwegian coast, and it was from this location that most of the music for this recording was initiated. The pieces are a combination of Icelandic sagas, ancient chants, folk songs, religious hymns and fiddle tunes, and with this alchemy of tradition and improvisation these musicians have brought together their deep Nordic roots into something that can converse with the present without compromising its unique character. 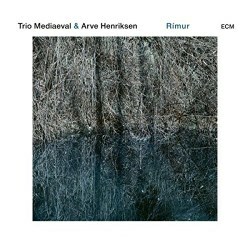 Trio Mediaeval has previously focussed on early music with the ECM label though they pop up all over the place, and the last time I reviewed one of their recordings it was associated with the Louth Contemporary Music Society (review). The three voices have a close unity, their clean sound ideally suited to mediaeval music as their name would suggest, but also providing a kind of blank canvas that can fit in almost anywhere. Rímur is said to emphasise the group’s interest in improvisation though this by no means ‘free improvisation’, with the voices always in sympathetic harmony with the melodies they are performing. Arve Henriksen’s contributions are also restrained, often taking a back seat and adding a low extra colour to the sound, as in Láta gjalla létt og hátt over which a solo voice improvises over the established chord pattern beneath. Anna Maria Friman describes the title of the album: “Rímur, songs in the unique Icelandic tradition of rhyming narrative verse, were originally performed by kvæðamenn (male or female chanters) who went from farmstead to farmstead and were offered hospitality when reciting an evening wake. Like most of the Scandinavian folk songs the Rímur have been orally transmitted for centuries. Later in the twentieth century ethnographers and folk song collectors began to record these wonderful songs and tunes, and a vast number of melodies have been transcribed and preserved for future generations of singers and listeners.” These and the traditional songs from Sweden and Norway occupy a comparable directness of expression, given a tasteful layer of sophistication in these arrangements. Instruments such as the accompanying fiddle in Du är den första deliver contrast, this particular song a perfect vehicle for some call and response with the trumpet and a nice build-up through the addition of voices after the first verse. Quicker numbers such as Jag haver ingen kärare also take us into lighter realms, though this is not the album you will be reaching for if you want to start up some dancing in the streets. Texts are given in the original and in English translation for most tracks. All of these pieces are lovely, but one highlight is the close intervals that give Bíum bíum bambaló a particularly emotive quality. This is the kind of recording that can take you to deeply meditative places, and I can imagine it gently accompanying candle-lit evenings when the troubles of the world need to be banished with some spiritually enhancing sounds. Beautifully recorded and performed, Rímur is indeed something a bit special.